Software radio (or software-defined radio, SDR) is an engineering pursue in wireless communication technology field that one day all wireless signal processing functions, which are typically implemented in hardware today, will be done completely in software. Over the years, researchers and engineers have made remarkable progress and have been constantly pushing the hardware-software boundary. 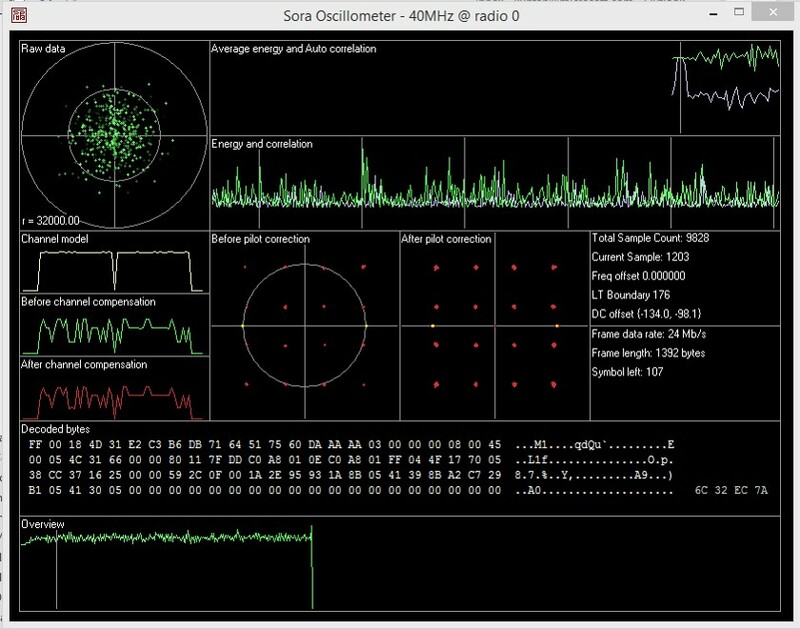 The Microsoft Research Software Radio (Sora) is one such recent success in advancing the state of the art in software radio technology. The goal of Sora is to develop the most advanced software radio that is capable of implementing the state-of-the-art wireless communication technology easily and efficiently. In late 2000s and early 2010s, the state-of-the-art is Wi-Fi and LTE. The implementation platform must then be able to handle OFDM, 64QAM, MIMO, CSMA, 40MHz channel width, and tens to hundreds Mbps data rate. This is a significant challenge for any software radio. There are many ways of building high-performance software radios. We choose commodity PC as the underlying platform. PC does have the advantage of a familiar environment with rich programming tools and ecosystem supports, but meeting the astronomical demands of signal processing in PC software and in real-time seems quite “mission impossible” to many people. In conventional wireless communication systems, the critical lower layer processing, that is, the physical layer (PHY) and medium access control (MAC), is typically implemented in hardware (ASIC chips), due to the high-computational and real-time requirements. Designing ASIC is costly, both economically and time-wise. It is also fixed, and therefore, once it is delivered, it cannot be changed or upgraded. The lack of flexibility and programmability makes experimental research in wireless communication become very difficult, especially for research groups in academics. Software Radio (or Software Defined Radio, SDR) holds the promise of fully programmable wireless communication systems, effectively supplanting current technologies that have the lowest communication layers implemented primarily in fixed, custom hardware circuits. It is an engineering dream that one day, all wireless functions will be implemented completely in software. Indeed, researchers and engineers have been making progress in this direction and has been constantly pushing the hardware-software boundary in wireless communications. Today, software radio developers are facing a platform dilemma. Many current SDR platforms are based on either programmable hardware, such as field programmable gate arrays (FPGAs), or embedded digital signal processors (DSPs). Such hardware platforms can meet the processing and timing requirements of modern high-speed wireless protocols, but programming FPGAs and specialized DSPs are difficult tasks. Developers have to learn how to program to each particular embedded architecture, often without the support of a rich development environment of programming and debugging tools. Hardware platforms can also be expensive. In contrast, SDR platforms based on general-purpose processor (GPP) architectures, such as commodity PCs, have the opposite set of tradeoffs. Developers program to a familiar architecture and environment using sophisticated tools, and radio front-end boards for interfacing with a PC are relatively inexpensive. However, since PC hardware and software have not been designed for wireless signal processing, existing GPP-based SDR platforms can achieve only limited performance. For example, the popular GNU Radio/USRP platform achieves only a few hundred Kbps throughput on an 8MHz channel, whereas modern high-speed wireless protocols like 802.11 support multiple Mbps data rates on a much wider 20MHz channel. These constraints prevent developers from using such platforms to achieve the full fidelity of state-of-the-art wireless protocols while using standard operating systems and applications in a real environment. Microsoft Research has provided a solution to this platform dilemma by developing Microsoft Research Software Radio (Sora), a fully programmable software radio platform that provides the benefits of both SDR approaches. It is based on software running on a low-cost, commodity PC with a general purpose OS (like Windows). We take a multi-core PC, plug in a PCIe radio control board we developed, and hook up a third-party radio front-end with antenna — that becomes a powerful software radio platform. The PC interface board takes the I/Q signals from the RF front-end and puts them into the PC memory as fast as possible (via DMA). It also takes the software-generated waveforms (outgoing I/Q signals) from PC memory and pushes them through the RF front-end at the right timing. No baseband signal processing takes place in hardware. All is left to the software running in the PC. The PC runs a normal operating system (Microsoft Windows) with the Sora drivers and SDK installed. The Sora software stack manages all aspects of the radio hardware and provides an environment for the programmers to manipulate the I/Q signals in main memory directly. The programmers can write any baseband signal processing software freely, usually in C language. The Sora software stack manages the system resources and enforces the real-time requirements. Additional software development tools and common signal processing libraries are also included in the Sora software package. This provides a convenient way for experimenting with novel wireless technologies. With Sora, developers can implement and experiment with high-speed wireless protocol stacks (e.g., IEEE 802.11) by using commodity general-purpose PCs. Developers program in familiar programming environments with powerful tools on standard operating systems. Software radios implemented on Sora appear like any other network device, and users can run unmodified applications on their software radios with the same performance as commodity hardware wireless devices. Transferring high-fidelity digital waveform samples into PC memory for processing requires very high bus throughput. Existing GPP platforms like GNU Radio (USRP) use USB 2.0 or Gigabit Ethernet, which cannot satisfy this requirement for high-speed wireless protocols. Physical layer (PHY) signal processing has very high computational requirements for generating information bits from waveforms, and vice versa, particularly at high modulation rates; indeed, back-of-the-envelope calculations for processing requirements on GPPs have instead motivated specialized hardware approaches in the past. Wireless PHY and media access control (MAC) protocols have low-latency real-time deadlines that must be met for correct operation. For example, the 802.11 MAC protocol requires precise timing control and ACK response latency on the order of tens of microseconds. Existing software architectures in the PC cannot consistently meet this timing requirement. We have developed a new, inexpensive radio control board (RCB) with a radio frontend for transmission and reception. 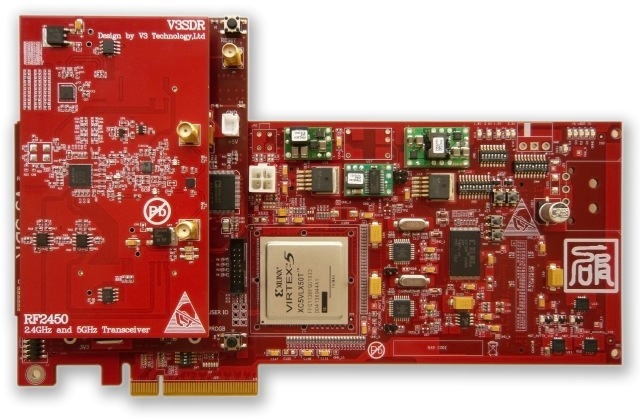 The RCB bridges an RF front-end with PC memory over the high-speed and low-latency PCIe bus. With this bus standard, the RCB can support 16.7Gbps (x8 mode) throughput with sub-microsecond latency, which together satisfies the throughput and timing requirements of modern wireless protocols while performing all digital signal processing on the host CPU and memory. Radio control board provides a high-speed PCIe interface to host PC. We change the conventional implementation of PHY components to extensively take advantage of lookup tables (LUTs), trading off computation for memory. These LUTs substantially reduce the computational requirements of PHY processing, while at the same time taking advantage of the large, low-latency caches on modern GPPs. Sora uses the SIMD (Single Instruction Multiple Data) extensions in existing processors to further accelerate PHY processing. With these optimizations, Sora can fully support the complete digital processing of 802.11b modulation rates on just one core (2GHz Intel x86), and 802.11a/g on two cores. To meet the real-time requirements of high-speed wireless protocols, Sora provides a new kernel service, core dedication, which allocates processor cores exclusively for real-time SDR tasks. We demonstrate that it is a simple yet crucial abstraction that guarantees the computational resources and precise timing control necessary for SDR on a GPP. The Microsoft Research Asia team has developed a demonstration radio system, SoftWiFi, based on the Sora platform. SoftWiFi currently supports the full suite of 802.11a/b/g modulation rates, seamlessly interoperates with commercial 802.11 NICs, and achieves equivalent performance as commercial NICs at each modulation. Sora is the first SDR platform that enables users to develop high-speed wireless implementations, such as the IEEE 802.11a/b/g PHY and MAC, entirely in software on a standard PC architecture. Sora has been used to implement and run the-state-the-art wireless standards including Wi-Fi and LTE. For Wi-Fi, Sora is able to do 802.11 a/b/g/n in full data-rate (up to 40MHz channel, up to 64QAM, up to 4×4 MIMO). The actual data rate is limited by the speed of the PC, but we have accomplished 802.11 data-rate up to 300Mbps. Spectrum-wise, Sora supports a wide range of radio front-end options, from standard Wi-Fi (ISM bands) to TV Whitespace (TVWS), in both single antenna setting and in 4×4 MIMO setting (8×8 also possible). In Sora, you write your entire baseband in C language. A highly optimized implementation of 802.11 a/b/g/n PHY is available in source code (so you can learn about Wi-Fi implementation or learn how to program in Sora). The SDK also comes with a rich set of common signal processing library (from FFT to Viterbi decoding, etc.) so you can reuse. The program model in Sora currently includes a vector computation library called Vector1 and a modular data-flow composition system called brick, both of which can help programmers to write high-performance baseband programs. Further, the SDK includes various tools, like helping users debug their signal processing programs, visualizing Wi-Fi decoding, etc. With Sora’s ability to run high-speed wireless systems in software, it becomes a powerful yet convenient tool for research and development in the wireless communication technology field. Here is a few examples that showcase Sora’s achievements. The PHY and MAC have been an active research areas for many years. New improvements have been frequently proposed on new PHY and MAC algorithms. However, experimental studies are extremely difficult to do at the bottom layers of wireless network. Without open software radio, these layers are all but hidden in the commerical hardware and totally out of reach for ordinary researchers. Sora is capable of running Wi-Fi at hundreds of Mbps in software and in real-time. The entire Wi-Fi PHY implementation is written in C and is open-source. Researchers can now modify the source code to implement their ideas and validate them in real over-the-air experiments. Hao Cui, Ruiqin Xiong, Chong Luo, Zhihai Song, and Feng Wu, “Denoising and Resource Allocation in Uncoded Video Transmission,” IEEE Journal on Selected Topics in Signal Processing, 2014. Feng Lu, Patrick Ling, Geoffrey Voelker, and Alex Snoeren, “Enfold: downclocking OFDM in WiFi,” ACM MobiCom 2014. Lynne Salameh, Astrit Zhushi, Mark Handley, Kyle Jamieson, and Brad Karp, “HACK: Hierarchical ACKs for Efficient Wireless Medium Utilization,” USENIX ATC’14 (awarded Best Paper). Feng Lu, Geoffrey Voelker, and Alex Snoeren, “Managing Contention with Medley,” IEEE transactions on Mobile Computing, 2014. Yufei Wang, Qixin Wang, Guanbo Zheng, Zheng Zeng, Rong Zheng, Qian Zhang, “WiCop: Engineering WiFi Temporal White-Spaces for Safe Operations of Wireless Personal Area Networks in Medical Applications,” IEEE transactions on Mobile Computing, 2014. Sangki Yun, Daehyeok Kim, and Lili Qiu, “Fine-grained Spectrum Adaptation in WiFi Networks,” ACM MobiCom 2013. Mohammad H. Firooz, Zhiyong Chen, Sumit Roy, and Hui Liu, “Wireless Network Coding via Modified 802.11 MAC/PHY: Design and Implementation on SDR,” IEEE Journal on Selected Areas in Communications, 31(8), 2013. Feng Lu, Geoffrey Voelker, and Alex Snoeren, “SloMo: Downclocking WiFi Communications,” USENIX NSDI 2013. Sangki Yun, Lili Qiu, and Apurv Bhartia, “Multi-point to multi-point MIMO in wireless LANs,” IEEE INFOCOM 2013. 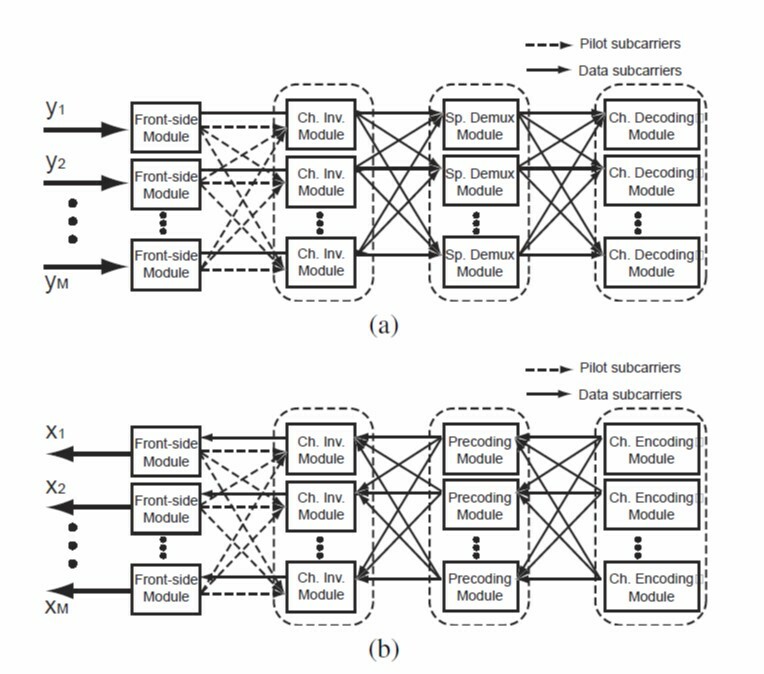 Zixia Hu, Zhiyong Chen, Hui Liu, Xun Shao, and Guanbin Xing, “System design for broadband digital radio broadcasting,” IEEE Communications Magazine, 51(4), 2013. Jiansong Zhang, Haichen Shen, Ranveer Chandra, Yongguang Zhang, and Qian Zhang, “Frame Retransmission Considered Harmful: Improve Spectrum Efficiency Using uACKs,” ACM MobiCom 2012. Xiao-lin Liu, Wenjun Hu, Qifan Pu, Feng Wu, and Yongguang Zhang, “ParCast: Soft Video Delivery in MIMO-OFDM WLANs,” ACM MobiCom 2012. Li Erran Li, Kun Tan, Ying Xu, Harish Visvanathan, and Y. Richard Yang, “Remap Decoding: Simple Retransmission Permutation Can Resolve Overlapping Channel Collisions,” ACM MobiCom 2010. Kun Tan, Ji Fang, Yuanyang Zhang, Shouyuan Chen, Lixin Shi, Jiansong Zhang, Yongguang Zhang, “Fine-grained Channel Access in Wireless LAN,” ACM SIGCOMM 2010. Kun Tan, He Liu, Ji Fang, Wei Wang, Jiansong Zhang, Mi Chen, and Geoffrey Veolker, “SAM: Enabling Practical Spatial Multiple Access in Wireless LAN,” ACM MobiCom 2009. TV Whitespace (TVWS) and dynamic spectrum access (DSA) is a hot research topic in wireless networking. To cover TVWS bands and extend outdoor range, we have built a 40MHz front-end option that operates in the 500MHz-700MHz band with a 1-4W configurable amplifier. It supports both single antenna and 4×4 MIMO setting, making Sora a very useful TVWS research platform. For example, we have rolled out a cellular-type TVWS research network to cover the Microsoft Redmond campus, and each basestation is just a PC plus 4 roof-top TVWS sector antennas. Everything else is software based on Sora. 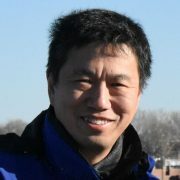 Kun Tan, Haichen Shen, Jiansong Zhang, Yongguang Zhang, “Enable Flexible Spectrum Access with Spectrum Virtualization,” IEEE DySPAN 2012. Project Istanbul: TV Whitespace network for Microsoft Redmond campus. MIMO (Multi-Input Multi-Output) is an important new wireless technology to significantly increase data throughput in the wireless channel by adding multiple antennas. In theory, more antennas will lead to higher throughput gain, but in practice we seldom see more than 4 antennas in consumer products or in commercial uses. In fact, there hasn’t been many reported studies or trials to build MIMO system with more than 10 antennas. One reason is the complexity of signal processing in large MIMO system. It will be tremendously difficult to build custom hardware or write FPGA code. However, software radio may have the advantage of being scalable and easy to program. 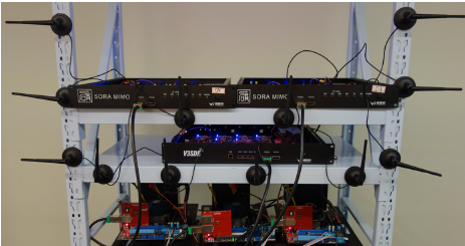 Indeed, we put together 3 Sora 4×4 MIMO kits and a dozen server PCs to build a big software radio with 12x antennas — to achieve close to 7 times throughput gain! How many antennas do you need? MIMO (Multi-Input Multi-Output) and MU-MIMO (Multi-User Multi-Input Multi-Output) are advanced wireless technologies that hold the promise of increasing the wireless channel capacity in a communication system. In theory, the capacity is proportional to the number of antennas in the system. The current state-of-the-art is limited to only a handful of antennas. 802.11n has up to 4 antennas specified in the IEEE standard, but we only see 2 or 3 antennas being productized. 802.11ac has up to 8 antennas in the standard, yet only 4-antenna is implemented. LTE standard is also up to 4 antennas. 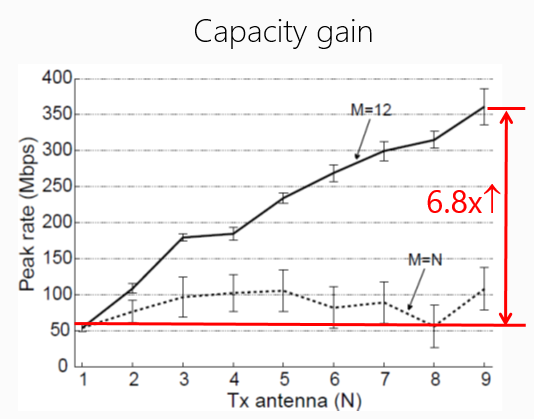 There has been little known system building and field-test study on MIMO or MU-MIMO with more than 10 antennas. One difficulty in implementing high-order MIMO is to deal with the tremendous computation and throughput requirement. A simple back-of-the-envelop calculation will show that the algorithmic complexity for spatial demultiplexing and precoding is proportion to the total number of sending antennas times the total number of receiving antennas times the number of subcarriers. This will rapidly grow beyond any single system can handle as the number of antennas goes up. To build a MIMO system that can support as many antenna as possible, we have to come up with a software radio system that is scalable in both computation and signal throughputs. It cannot be done with a single PC. Instead, we have used a cluster of PC servers and a fast Ethernet network. And of course the software has to do this in real-time. We have come up with a scalable MU-MIMO implementation system called “BigStation”, which is designed to scale to tens of antennas and hundreds of subcarriers. Our over-the-air experiment was conducted on a moderate size system with 12 MIMO antennas, 52 subcarriers over a 20Mhz channel, 9 mobile nodes and 9 independent data streams. The system uses 3 Sora 4×4 MIMO PCs, 15 low-end quad-core servers, and one 1/10GbE switch. Qing Yang, Xiaoxiao Li, Hongyi Yao, Ji Fang, Kun Tan, Wenjun Hu, Jiansong Zhang, Yongguang Zhang, “BigStation: Enabling Scalable Real-time Signal Processing in Large MU-MIMO Systems,” ACM SIGCOMM 2013, Aug 2013, Hong Kong. When Microsoft Research first demonstrated the capability of Sora technology in 2009, there was lot of excitement in the research community about its potentials. Microsoft Research then decided to share this discovery and the technology with academics, aiming to encourage the use of software radio to advance wireless networking research. An academic program was created and a team formed in Beijing, China to build and maintain the Sora Academic Kit. Today, Sora has more than 50 institution users and it has driven many wireless research projects around the world. This page contains information on how you can build a powerful software radio research platform based on Microsoft Research Software Radio technology and the Academic Kit. First, please understand that this is not a Microsoft product. It comes with no warranties and we disclaim all liabilities. If this ever causes any one any harm, you will indemnify Microsoft. (In another word, you do it at your own risk! Don’t touch it if you don’t know what you are doing.) Further, no intellectual property is granted; all IPs belong to Microsoft or their respective owners. It can only be used for non-commercial academic research and education purpose. If you are okay with this, please read the Microsoft Research Software Radio Academic Kit License Agreement carefully. We require signature from someone who has the authority on behalf of your institution. (We won’t accept forms signed by a student, post-doc, or in some case, junior faculty.) Once you return the form, we will connect you to a local make-to-order vendor company, who can supply you with the hardware, either component-by-component or as an integrated system (“turn-key” solution). Please note that we (Microsoft) do not make or sell Sora hardware. The vendor company makes hardware according to Sora spec, and charges you a fee to cover the components and assembling (plus S&H). A Shuttle XPC with RCB and RF plugged in. We recommend you use a high-end PC (workstation-class or server-class) with a performance desktop or server CPU (at least quad-core). We suggest the latest Intel Core i7 or Xeon (“Nehalem” or later). Some quad-core Core i5 may work, but we haven’t tested it extensively. Here is the list of CPU (and motherboard chipset) models that we know will work: Intel core i7-9xx (X58), i7-2600 (H61/H67), i7-3770 (H61/H67/Z77), and Xeon E5-16xx/26xx (C602). Older Intel “Nehalem” or “Core 2” quad-core CPU should also work. We haven’t tested any AMD processor. The amount of memory and disk space is less important and will depend on what you plan to do. We recommend at least 2G RAM for single-radio and 8G RAM for MIMO. RCB is the most important component in Sora hardware. We now have two types of RCB. The original RCB is a full-length full-height PCIe card designed to be plugged in a PCIe slot inside the PC. Due to the space limitation, it is almost always used in a single-radio setting (like in the Shuttle XPC picture above). The ballpark estimate for the original RCB is RMB¥10,000 (US$1.7K). The actual amount will be set by the vendor and will be affected by component market price and also currency exchange rate. 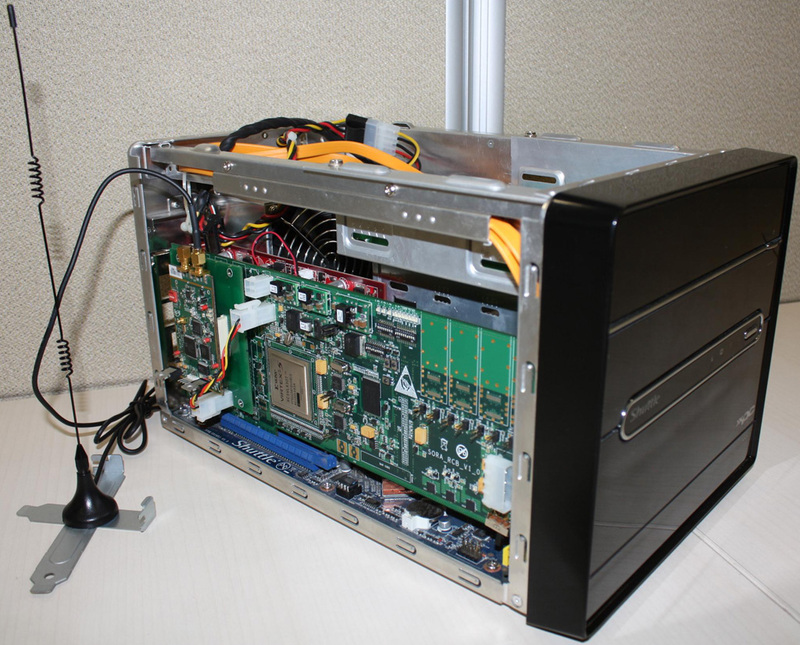 The MIMO RCB comes as a PCIe external enclosure box. The 1U, half-depth, and rack-mountable enclosure houses the MIMO RCB, 4-way RAB, and up to 4 RF daughter-boards. It connects to the PC with one or two external PCIe extension cables. We can download the software from codeplex. It runs on 64-bit Windows 7 or 8. 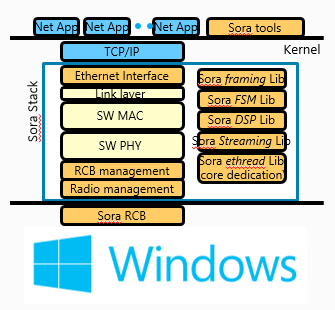 Starting from SDK 2.0, Sora now supports MIMO. The SDK also includes the Brick source code of a working implementation of 802.11n. SDK v1.8 upgrade includes a rewritten 802.11a/b/g baseband using Brick. The baseband source code is now highly modular, very easily to understand and modify. SDK v1.6 upgrades the UMX API and supports a new Reflection mechanism to integrate user-mode SDR modem into Windows network stack. It also includes a new modular programming library, called Brick, for high-performance DSP programs, and two new powerful tools: DbgPlot for real-time monitoring and debugging and UMXSDRab as an interactive 802.11a/b modem application based on UMX Reflection. SDK v1.5 is a major facelift from previous v1.0 and v1.1. It fixes almost all bugs known to us (like the bluescreens) and substantially changes the implementation to provide a more flexible, robust, and friendly developing environment. In particular, we have a new ethread scheduler, a full-fledged user-mode extension, and a set of new tools for testing hardware and tuning RF parameters (gains, I/O imbalance, central frequency), etc. The PDF version of the Sora Manual is here. You must have RCB hardware installed before you can load and run the driver and SDK. The RF daughter-board connects to the RCB through a well-defined Fast Radio Link interface. In principle, you can obtain any third-party RF daughter-boards and play mix-and-match. But unless you want to experiment with the hardware, we recommend you get one of the supported RCB-RAB-RF combos when you buy the RCB. Many RF daughter-boards require a RAB (RF Adapter Board) to work with RCB, and we have worked with our RCB vendor to provide several types of RAB for some common RF daughter-boards. For MIMO, you should almost always obtain the whole Sora MIMO Kit (integrated RCB, RAB, and 2-4 RF daughter-boards in one enclosure box). It is extremely challenging to get MIMO hardware right. The following is a list of third-party Radio Front-ends that are known to work with the Academic Kit. We will update the list when more become available and have been tested. Again, we (Microsoft) do not make or sell any Radio Front-end, nor do we endorse any particular brands or makers. Note 1. Single channel setting only. Not compatible with Sora MIMO Kit. If you have or know of a Radio Front-end that is proven to work with our Academic Kit, please let us know. The Microsoft Research Software Radio (Sora) project started as a “blue-sky” research project in the Wireless and Networking Group at Microsoft Research Asia (Beijing, China) around 2007. The goal was to advance the state-of-the-art in software radio and build a platform that can achieve wireless performance orders of magnitude better than existing systems. In 2009, it surprised the world when it first demonstrated the ability to run a full-rate 802.11 entirely in PC software, which was never thought possible before. In 2010, Microsoft Research created an academic program and release the Sora Academic Kit to share this technology with the research community. Today, Sora has facilitated many wireless R&D around the world. 2008 First internal demo of 802.11b. 2009 First public demo of 802.11a/b/g, NSDI best paper. 2010 Sora Academic Program started. 2011 Sora Academic Kit v1 released. 2013 Sora Academic Kit v2 (MIMO) released. Kun Tan, Jiansong Zhang, Ji Fang, He Liu, Yongguang Zhang, and G. M. Voelker, “Sora: High-performance Software Radio Using General-Purpose Multi-core Processors,” Communications of the ACM, 54(1), January 2011. Experimenting Software Radio with the Sora Platform. In SIGCOMM 2010, New Delhi, India, Sep 2010. Sora is now an open source project (both software and hardware). Sora SDK Ver 2.0 is released. For budgetary purpose only. Actual cost will vary.